The ABA-FILL-TFGEA is an electronically controlled, net weight, automatic filling machine which is designed to top fill half pint to 5 gallon containers. The ABA-FILL-TFGES is an electronically controlled, net weight, semi-automatic filling machine which is designed to top fill half pint through 5 gallon containers. The ABA-FILL-TFxEA machine is an electronically controlled, automatic, volumetric machine which is designed to top fill open top containers utilizing one or five gallon double acting pumps. The ABA-FILL-TFxPA is a pneumatically controlled, automatic, volumetric machine which is designed to top fill open top containers utilizing one or five gallon double acting pumps. The ABA-FILL-TFxPS machine is a pneumatically controlled, semi-automatic, volumetric machine which is designed to top fill open top containers utilizing one or five gallon double acting pumps. The ABA-FILL-TFxPS-X machine is a pneumatically controlled, semi-automatic, volumetric machine which is designed to top fill open top containers utilizing one or five gallon double acting pumps and designed for a C1D1 or C1D2 area. 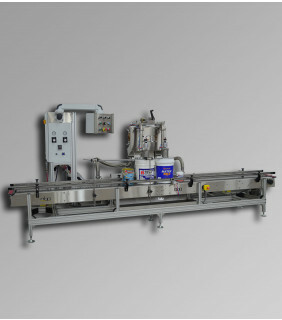 Top fill filling machines provide the best solutions for filling non-foaming liquids into open-top containers. Containers are positioned beneath the fill head(s) and liquid flows from the fill head directly into the open container below. 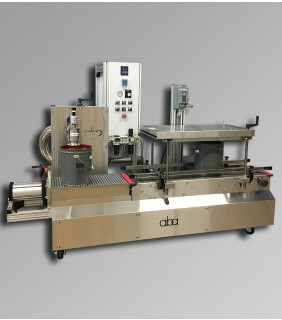 Here at ABA, we have almost 3 decades of supplying the best top fill filling machines on the market. Our high-quality top fill machines have stainless steel wetted parts and utilize the latest innovative technology available. 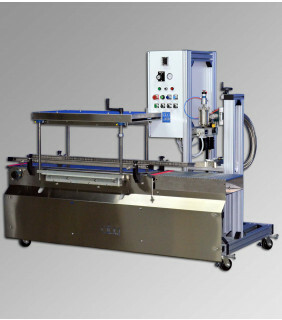 We supply both automatic and semi-automatic top fill filling machines to the paint, chemical, and coatings industries. 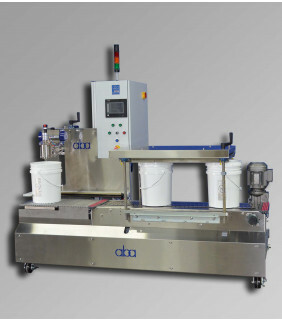 Depending on your company's needs, we can assist with custom designing the right filling machine for your environment. One of our experienced and knowledgeable representatives will assist you right away. 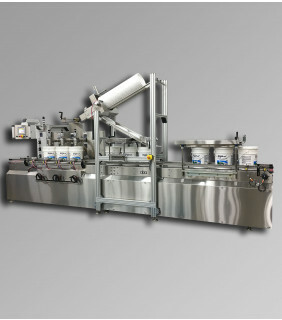 Visit or contact us directly to get started on acquiring your new top fill filling machine today. I must honestly and sincerely say that you and your company have set the bar high. An excellent product, and an equally excellent staff. You should be proud of your company, your people, and it is ok to even be a little proud of yourself! It is truly a pleasure doing business with you. With a hard to bottle product, Tony and his team produced a very robust and accurate machine that exceeded our expectations. I am very impressed how quickly they responded to questions and concerns from quoting through commissioning. I highly recommend ABA. Our experience with ABA has been very positive and knowledgeable. From the initial call we were able to relate our needs and special production application to ABA’s representatives, with full understanding and feedback of our project. During the setup the equipment was easy to install with sufficient information to understand the procedures, maintenance schedules and troubleshooting guide. For full testimonial, please visit our testimonials page. 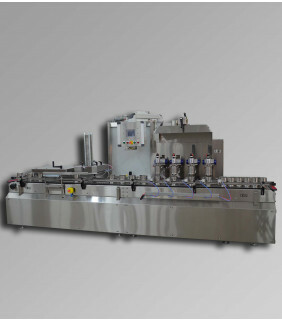 ABA filling machines are offered as either volumetric or net weight and can be designed to be top or bottom (diving lance) fill. We manufacture our own conveyors, rotary feed tables, lid placers, lid droppers and lid crimpers. ABA equipment is designed to fill a variety of liquids ranging from water thin to high viscosity. Many of our machines are designed to be intrinsically safe for explosion proof areas and can be made to meet C1D1 or C1D2 standards. For a look at some examples of products our machines have filled, check out our industries page. © 2017 Anthony Barber Associates. All Rights Reserved.